Defined as degeneration of the cartilage and underlying bone within a joint, in addition to bony overgrowth, OA most commonly affects the hips, knees, spine, and hands.2 Advanced age (older than 65 years) is the factor most frequently associated with OA; other contributing factors include genetics, obesity, and trauma. Symptoms, which range from mild to debilitating, often lead to significant lifestyle limitations as a consequence of pain and decreased function. According to the Centers for Disease Control and Prevention (CDC),3 80% of patients with OA have some limitation of mobility, while 25% are unable to perform the activities of daily living (ADLs). These statistics underscore that it is essential for primary care providers to be aware of the conservative treatment measures available for OA. 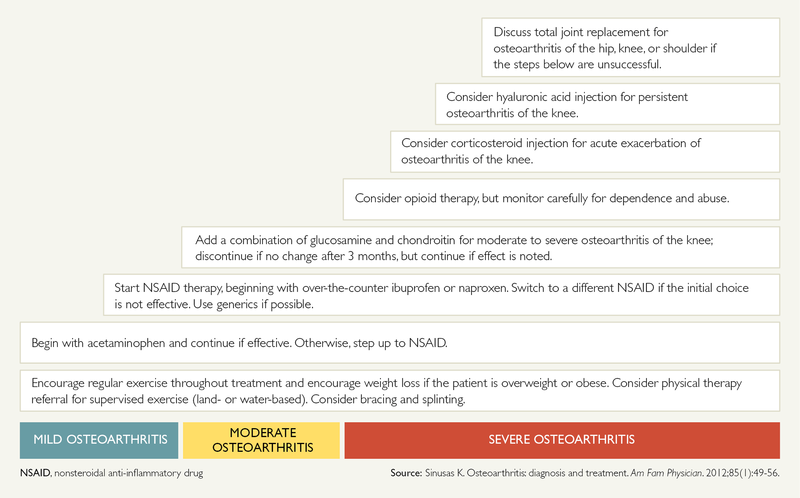 Which of the following is the most effective conservative treatment option for osteoarthritis? Currently recommended conservative treatments are weight loss, physical therapy/exercise, activity modification, drugs, braces/orthotics, and intra-articular injections (Figure 1).4 Each of these measures has proved helpful for some patients, but treatment should be individualized and based on the degree of arthritis and disability and on any comorbidities that the patient may have. Treatment options can be expensive and may not elicit desired outcomes; therefore, clinicians must consider cost as well as potential risk/benefit for the patient before initiating treatment. By taking all of these variables into consideration and choosing the best treatment for individual patients, primary care providers can decrease pain and increase function, thus improving patients’ satisfaction and reducing the number of patients who seek nonoperative treatment from a specialist, which is not always available or necessary. An initial treatment option for OA is activity modification. More often than not, patients are capable of pointing out specific activities that worsen their pain, such as climbing stairs, squatting and stooping, bending, sitting for long periods of time, heavy lifting, walking long distances, and high-impact exercises. Whereas simply avoiding these is enough for some patients, others may have to modify work level and/or athletic activities. According to the American Academy of Orthopaedic Surgeons (AAOS),5 this may mean switching from high-impact exercises such as running and competitive sports to low-impact exercises such as swimming and walking. As irrelevant as this change may seem, activity modification has been shown to reduce and/or relieve arthritic pain for many. When providing patients with a home exercise program, the provider should stress that engaging in exercise is a goal to work toward over time and that the extent and duration of the exercises performed can be increased gradually. 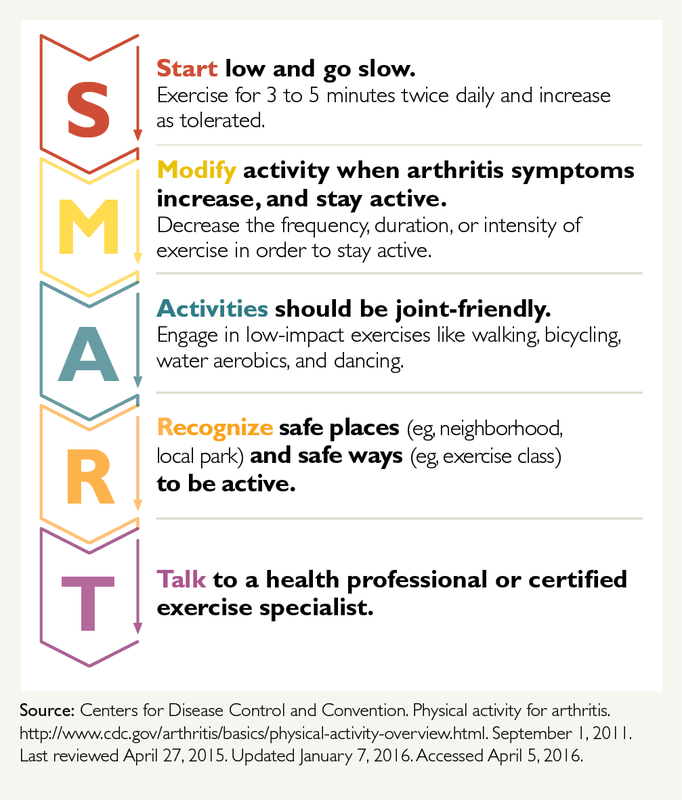 Patients may not experience much benefit until they have been exercising consistently as instructed for 6 to 8 weeks, but providers should encourage them to continue because perseverance is likely to result in long-term pain relief.3 According to the CDC,3 the recommendations summarized by the acronym SMART (Figure 2) are good for patients with OA to abide by because some physical activity or exercise is better than none at all.